I wasn’t happy with the recipes for homemade laundry detergent I was finding so I played around a little with the measurements & made my own. I’ve been using this for several years & have converted many of my friends too. 5 gallons cost you less than $2, & you just can’t beat that. For a little extra cleaning power, you can add OxiClean to the wash with it – and for Tide fans, please check out this version! For extra scent, you can mix in a bottle of one of the many laundry scent boosters on the market (or add it individually to each load, that’s what I do actually). You can also use a few drops of your favorite essential oils to the rinse load of your wash load. 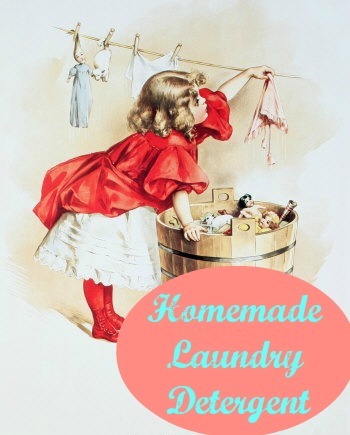 Make sure you check out my Homemade Fabric Softener & my Homemade Dryer Sheets! Buying laundry detergent can put a big dent in any budget, and making my own is one way where I save the bucks. If you bought 5 gallons worth in the store, you’d be paying around $100!! Maybe even more than that depending on the brand. But, when you make your own – you can make 5 gallons for less than $2!! When I buy all the ingredients for the first load – it comes out to $6.95 – but there is still lots of borax & washing soda left, so all that I need to buy for the next few batches is the Fels Naptha soap (which is really cheap!). That makes 20 gallons for under $10! Making your own detergent accounts for some enormous savings! You can also purchase the ingredients on Amazon, but I’ve found that they are more expensive this way for the borax & washing soda . However, the Fels Naptha price isn’t bad on there. You can also use essential oil for scent, but that’s completely optional. The essential oil adds nothing to the cleaning power, but does give it a nice smell if you’d like to have it. If you do want the added scent, I really like using orange essential oil because of the clean smell that it has. Plus, it’s also the one that I recommend for using in my homemade carpet powder. If you purchase it onAmazon (which has a great price on it), it runs about $5.00 for 4 ounces. You only need 1/2oz to 1oz for a 5 gallon batch (depending on how much scent you want) so it lasts for a good while, and doesn’t add much to the final cost. Still way cheaper than store bought. If you’re a Tide detergent lover – click here for the version which includes the power of Tide! So, are you ready to make your own laundry detergent & rack up the savings? I’ll walk you through how I make mine. First, you grate up your Fels-Naptha soap. Or you can substitute Zote (which will make your laundry detergent pink for all your girly-girls) or pure pure castile soap . Add the soap shreds to a pot with 4 cups of hot water. Put the heat on medium-high, and stir until completely melted – about 10 minutes. Fill up a 5 gallon bucket halfway with hot water. Pour in the melted soap mixture. Then, stir in 1 cup of borax & 1 cup of washing soda. If you’re using the essential oil, now is the time to add it. You add in 1/2oz to 1oz, depending on how scented you want it. Although, I never really measure it anymore – I just shake in enough drops to where I feel satisfied, and stir. Now, fill up the bucket with warm water all the way to the top – and stir again. If you don’t have a utensil long enough to reach the bottom, just put on a pair of rubber dish gloves beforehand. Snap on a lid, and let it sit for 24 hours to gel up. At this point, you can divide it up between different containers (empty laundry detergent containers, milk jugs, etc). I prefer to save 1 laundry detergent container, & refill it as needed to save on space. A lot of people like to dilute it even more at this step (therefor turning the 5 gallons into 10 gallons) – filling their container halfway with the gel & then the other half with water. You can choose to do this if you like. However, my family seems to produce pretty dirty clothes, and I prefer to not dilute mine further. I feel like the cleaning power is stronger this way. For HE front loading washers, use 1/2 cup for a large load. For regular top-loading washers, use 1 cup for a large load. You can use stain removers or oxi-clean with this too if you would like – just the same as you would use them with the detergent you buy in the store. I love this detergent, and have compared it to store-bought & I can’t tell a difference. You can leave your homemade detergent in the bucket, or you can split up the large batch between empty detergent containers, milk jugs, etc. Want to get some more recipes for making your own store-bought products? Click here to see the Mrs’s other make-your-own recipes! Interested in more ways to stretch your dollars? Then make sure you take a look at the Frugal Living category as well! Grate the Fels-Naptha soap. Add the soap shreds to a pot with 4 cups of hot water. Put the heat on medium-high, & stir until completely melted - about 10 minutes. Fill up a 5 gallon bucket halfway with hot water (I like to use the shower for this, it's easier in my opinion). Pour in the melted soap mixture & give it a quick stir. Stir in the borax & washing soda. If your'e using essential oil, now is the time to add it. You add in ½oz to 1oz, depending on how scented you want it. Although, I never really measure it anymore - I just shake in enough drops to where I feel satisfied. Stir the contents again. Fill up the bucket with warm water, all the way to the top - and stir again. If you don't have a utensil long enough to reach the bottom, just put on a pair of rubber dish gloves beforehand. Snap on the lid, & let it sit for 24 hours to gel up. 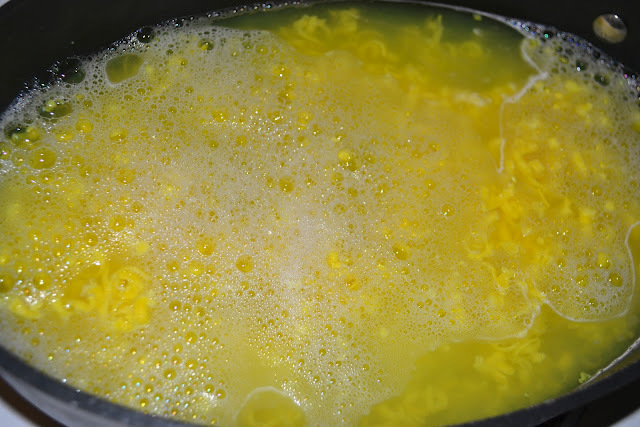 It will have the consistency of egg noodle soup - watery with glops of gel.... This is what it should look like! If you would like a smoother consistency like the store-bought brands, you can use an immersion blender at this point to smooth it out. I don't bother with this step though personally - the 'glops' dissolve just fine in the wash - and having a smoother consistency has no effect on the cleaning power or finished product. At this point, you can divide it up between different containers like empty laundry detergent containers, cleaned out milk jugs, etc. I prefer to use 1-2 empty containers, and leave the rest in the bucket to save on space - refilling my containers as necessary. Super easy! Love it! One quick question though, my soap has been sitting over night and it isn’t really gelling…at all. It is completely liquid. Just sorta cloudy. I am still using is and it seems to be working fine I just thought maybe someone else may have had the same issue. Thanks! After 24 hours, it should have sort of an egg noddle soup texture…kind of a gloppy gell, and that’s completely normal. would it be acceptable to use Dr. Bronners liquid castile soap instead of castile bar soap? any chance i could get my other question answered? i’ll repeat it here: would it be acceptable to use Dr. Bronners liquid castile soap instead of castile bar soap ? I have always used the bonnets instead in all my homemade soaps and works wonderfully. I haven’t tried it, but I have tried other recipes that use liquid dish soaps. They still work well, but your laundry detergent will be thin and will not gel. If you want a thicker consistency, stick with the bar soap. My first batch did that.. On my second.. I melted the Fels-Naptha soap longer before I mixied it in and it gelled up grate.. I use a no grate liquid formula similar to this but there is no cooking. 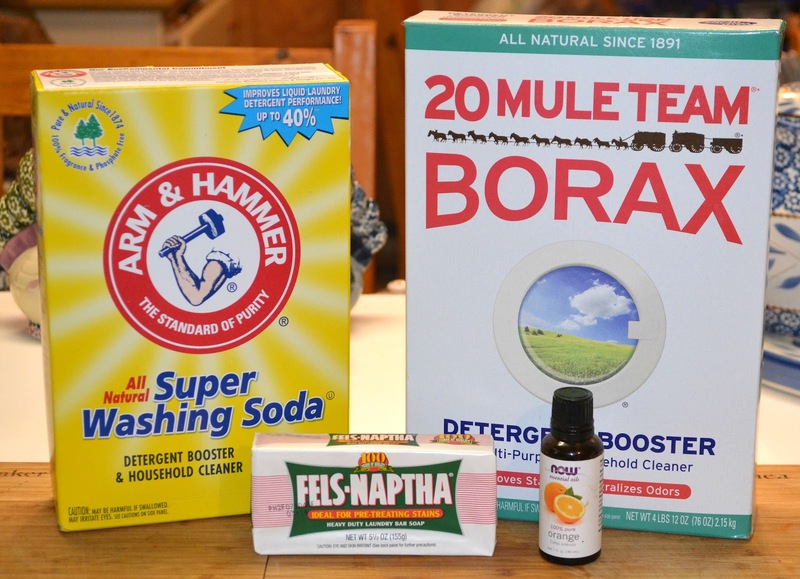 The ingredients are as follows for 1gal: 3 TBSP borax, 4 TBSP washing soda and 3 TBSP Dawn dish soap( original not concentrate) I add the borax and washing soda into a recycled 1 gal bottle then I boil 2 cups of water add that to the bottle and put the lid on and swish it around to dissolve it. Then fill the bottle to about 1″ from the top with warm water then add the dish soap. When I use this I give the bottle a shake before adding it to the wash. It is so easy to make. The best part is it doesn’t take up much space. Does this work with liquid cattle soap do you know? Thanks! It will work with any fatty acid and lye soap (true SOAP, meaning saponification was used in making it). Probably even with other soaps, but the lye soaps work like a charm. where do I get the essential oils? are these the ones sold near candles? Yes, you can get them near the candles in some stores. There’s also a link above to get them off of Amazon too, if you’re interested. Will those oils not leave an oily stain on your clothes? I have been scared to try any of those. I just made this was pretty easy Only problem I had was the essential oil I had to get some at Hobby lobby which was 10.00 but should be able to use 3 times.Can’t wait to see how it goes was fun making it and smells really nice. I don’t use the essential oil in mine at all because the fels naptha soap has such a nice scent to it… citrusy and very clean smelling. I feel the same. We really like the smell of the fels naptha soap. If you put the Fels Naptha in the microwave for about a minute it will be much easier to grate, It will bubble, let it cool, it will grate into a powder. I am about half way through my first batch and love it. Thanks for the info about essential oil. I didn’t do it this time because i was unsure of the amount. Now I know! sounds great I will have 2 try it. I have an HE front load washer. Any problems with using it with mine? It works great with an HE washer! I made a batch of this exact thing last night. Set overnite perfectly. Question ; this can be used safely in a HE washer just as is without dilution ? I’ve stirred the heck out of it but am left with what is a gel. Just being careful so looking forward to your response. Thanks ! I use my stick blender (the kind to mix protein powder drinks with) and mix it up by dunking it into the glop, blend a minute or so then lift, move then dunk, blend… etc. It will mix it nice and smooth like store bought detergent, easier to pour in your containers. It will separate in your containers again, but give it a few really good shakes and it will be fine. 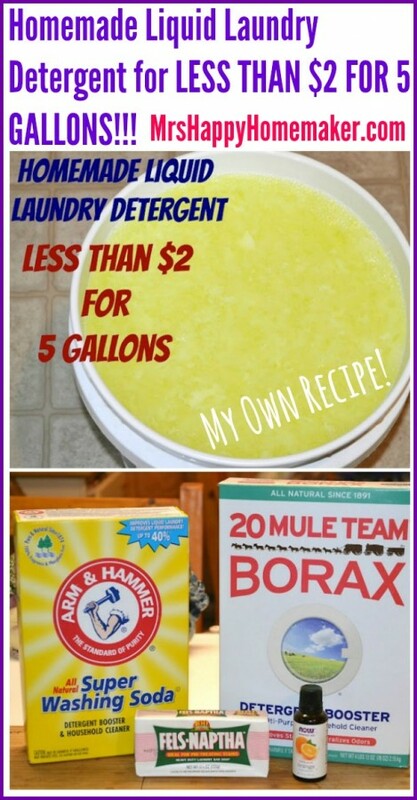 Can you make this same batch… but instead of using one cup borax & one cup washing soda .. use two of each? & also .. I made some liquid detergent & it got a crust like thing at the top and just liquid at the bottom… does that mean I didn’t do it right?? no you did it right!! just mix it up and it will be great!! u can add more or less of each product depending on ur water conditions, and dirtyness i use 2 cups!! pls i add oxy clean to the water!! Thanks for the laundry soap recipe, it worked great! Do you have a recipe for Homemade Fabric Softener? For fabric softener, use 1 c. white vinegar, 2 c. cheap hair conditioner (white rain or suave in your favorite scent) and 3 c. hot water… shake it up and use 1/ 4 c. or so per load, depending on your preference… works GREAT and so cheap! Add the vinegar, and mix well. Pour fabric softener in a bowl & soak the wash cloth, you can either use it damp to throw in the dryer with the wet clothes or you can hang dry a few wash clothes at a time & put them in the dryer with your load of clothes. Each sheet will last about 6 loads before you need to redo them. Mine separated, as well. A very thick layer of yellow gel on top and all liquid underneath. I made 3 gallons; 2 Fels Naptha, 2c. washing soda, 2c. borax. i use the same recipe as Crystal and dilute it to make 10 gals and have an HE washer and my clothes are clean.I have been using it about a year. Love it. She could just uae about a fourth cup. Use a stick blender, it will blend it all up right in the bucket. OR add 2 more gallons of boiling water and blend. How much tide do you put in for a 5 gal batch? I am concerned that adding the essential oil would put oil spots on my clothes. I realize that it is a small amount that is added, but I hate trying to get oil out of clothes. Any problems with this? The essential oil in the laundry detergent is only for scent, and it’s not needed for the cleaning ability. I have personally never had a problem with any spots on my clothes, but you certainly don’t have to had it if you want it. It is an optional ingredient. Hi I have a family with sensitive skin, any problems? Also my washer is a top load HE, how much do I add? I have been making my own laundry soap for about a year now.Very similar to this recipe except I use two bars of ivory soap. My son use to complain his skin was always itchy with store bought detergent.It didn’t seem to matter what type,he complained.Since I’ve been making this,no complaining. I love it! I also make my own softener. 1/2 cup baking soda mixed with 1 cup water. (in a big bowl) Slowly add in 6 cups vinegar. Then whisk in 5 more cups of water. I add 20 drops of essential oil. Usually rose,but you can use orange or lavender.What ever you prefer.I reuse my old softener bottles.I have an HE washer and these recipes work great. Hope this was helpful. When do you add the fabric softener and how much softener do you use per load? I make my detergent as a powder and it’s a tad bit easier. Shaved bar of soap, 1 c. of borax/1c. of washing soda – makes a powder solution and you only need to use 1 tbsp per load so it last for awhile. You can double the amount if you want to make a larger batch. Super easy and works great! Ive been trying to make this. It doesnt gel right. The top solidifies into a gel and the bottom is liquid. No matter how much or long i heat it or stir it, it will separate and the gel is so hard i cant use it. How do i make it right? I use my stick blender (the kind to mix protein powder drinks with) and mix it up by dunking it into the glop, then lift, move then dunk… etc. It will mix it nice and smooth like store bought detergent, easier to pour in your containers. It will separate in your containers again, but give it a few really good shakes and it will be fine. The basic test to check the purity of an essential oil is to put one drop on a piece of white paper, and let it sit over night. If, in the morning, there is any oily residue left on the paper, the “essential oil” was either a) cut with a base oil, or b) is not an essential oil (fragrance oil). Thanks! I found a natural alternative recipe using lemon juice, hydrogen peroxide, and water. I’m getting ready to start making my first batch of this! Excited! I made mine last night and today it looks more watery than gloopy. It smells amazing, but watery. Can I use it or do I start over? 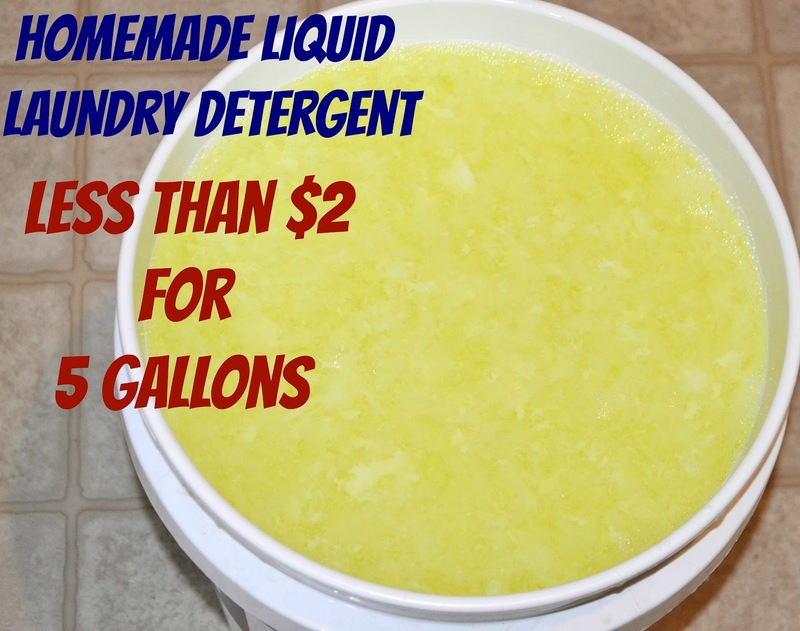 Pingback: Homemade Liquid Laundry Detergent with the Power of TIDE!! Hi! I followed your recipe to a “t” and did not have any scent smell when I dried my clothes. I did have a question for you. The clothes seemed clean until I did a “double check” on my husband’s workout tees and found some “smell” lingering. Any suggestions?? I was hoping to not have to add in any extra cleaners unless they were also natural. Please help!! 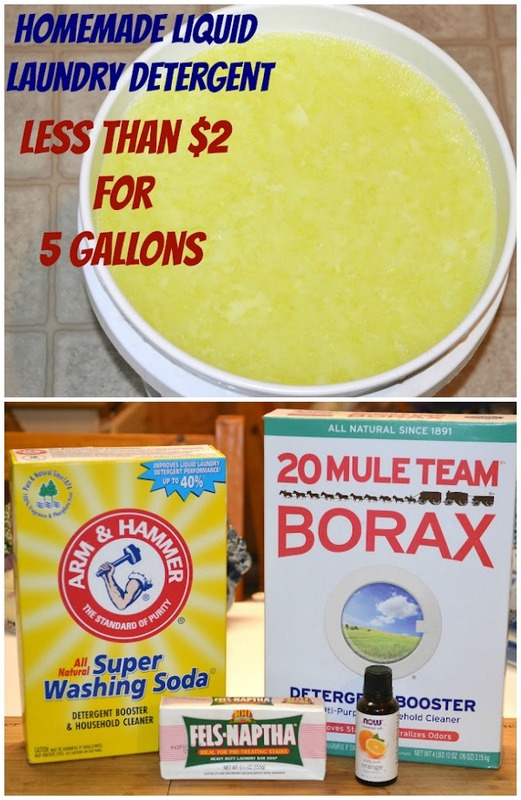 You could increase the borax & washing soda in the recipe by about a half a cup to make a stronger detergent. Does this laundry soap go bad? I have a family of 4 and a 5 gal bucket will last us quiet a long time. I made a half batch (2.5 gal bucket) and it took me a year and a half to use up in my family of 1 = me. By the end it had dried a bit so sometimes it left detergent spots in my clothes, I really should’ve added water to solve that. I have used a similar homemade detergent before in a powder form and noticed after awhile my clothes were totally faded. Anyone have this happen with this formula? I was wondering if this was a good detergent for cloth diapers? O M G! You guys are so awesome! I was using Borax with baking soda(not washing soda) in my wash with store bought detergent, when I could have been making my own detergent all along!! And I buy the essential oils for skin care and whatever else so these recipes are perfect! In fact, I was going to buy a gallon of this wholesale, prefab, generic detergent this weekend for $35, but now that I know I can make my own with the stuff I already use I am so excited! Plus it will be a great project for me and the kids. My kid also had issues with detergents on her clothing. Sometimes I had to double rinse, but then I started to wash their clothes with baking soda, borax and use shout for stains. No problems. But if I can make gallons of this stuff it would save me a lot more money. Thanks. Can you use the liquid form of castile soap since that is what i have on hand? YES YES YES! For me it works much better than having to dissolve flakes of soap! I use 1c baking soda wash, 3/4c borax, 8oz of Dr. Bronners castile soap (liquid) and about 18c water. Heat on stove top. Remember to dissolve the dry ingredients first in the hot water as doing so after adding the castile soap makes too many bubbles. i have done this many times now and we dont buy store bought soap!! i have starting using the scented laundry beads in it. I add them to the boiling soap, only need like a oz. Also i use a small grater its handheld (like a bigger microplane) and it shreds it very fine so i only takes time for the water to boil ti dissolve it. Also after it sits overnite i blend it up with my hand to break up the goo stuff. Just wonder if anyone has tried using an immersion blender to break up even more?? Has anyone added oxyclean to the recipe? I thought I saw that somewhere but now can’t find that particular recipe. I saw it for the powder recipe but not liquid. Just made our first batch, thank you! Has any one ever used “Dr.Woods Castile Bar Soap”? I was wanting to add it instead of using essential oils. 1. Shelf life- Lasts as long as you have it. Doesn’t go bad- I left a misplaced gallon jug of it in my mother-in-laws camper for the summer! It STILL smelled awesome and worked great! I figured if it would have gone bad – the oven like heat temps would have done it in… Nope Also, I made 6 months worth at once… it was excellent to the last drop! 2. Cleaning power- I have a family of 5 sons (4 are teens and above and the youngest in 12) All VERY active and tend to be quite messy! A Hubby whose job is as a maintenance Man- NO telling what he will come home covered in! Paint, Mud, oily gunk you name it or can picture it in your head and I’ve dealt with it…LOL And we have 2 medium sized dogs that have pet mattresses. I ONLY use cold water to wash and to rinse and this detergent. It works AMAZINGLY! 4. Consistency- It all depends on the heat, cold and humidity of your home. My detergents have been solidly thick, clumpity clumpy, layered thick on top of watery…plain ole watery, and everywhere in between. Now if it’s a weird consistency while in the larger container (the ‘holding’ bucket) I use a wire whisk before I transfer it, to mix it well! 5 Allergies- Most of my family is allergic to name brand detergents.they break out in horrible bubble rashes, especially around the collar area that resemble small clusters of grapes… not the case with this recipe! 6. Essential oils or not- I have used essential oils when in a luxurious mood with NO ill effects. No left over oil spots or over powering aromas…and no odoriferous malfunctions when in contrast to that manly man smell guys have that sometimes turns a shirt ‘sour’ smelling…I haven’t figured the why of it yet except that it doesn’t happen with this recipe. yep it work great I think. fels-naptha has a pleasant clean smell and out clothing comes out clean I see no reason to buy store detergent again. thank you SO much for this! 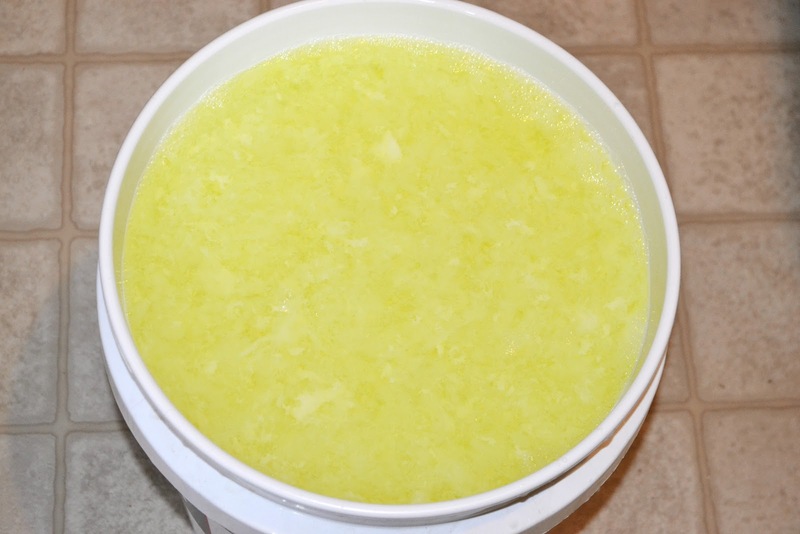 quick question…when i’m transferring from the bucket to the bottles, i seem to have a ton of the jelly stuff on top and mostly watery on the bottom. should i transfer until the the jelly stuff is in containers and toss the watery stuff or is the stuff on the bottom just as good. i did mix it up after it jelled but the jelly stayed at the top. I use a my husbands drill and paint mixer attachment to mix it before I divide it into smaller containers. I also let it sit for a day or so after I make it before I divide it. Man! It’s been awhile since I was here! lol… As for the jelly part on top and the watery part on bottom? I have started using my ‘stick’ mixer to mix it up really good and then pour. When you have transferred to other containers- just shake them good to remix and use as usual. Separation is normal! Thank you for writing this “novel”, it answered all of my questions. Thanks so much Ginger. I made the soap and it turned into a gel, but I don’t know where to put it in my front load to use it for washing. I placed it in the liquid compartment, but it didn’t dissolve, I placed it in the powder compartment, and still no desolving. Have any of you had this problem a and what did you do to resolve it?? Try putting it in the washer tub before you add your clothes, or you could dilute it a bit more right before you use it. 1/2 c. soap and 1 c. warm water then mix it together. You could see if it works in the drawer, or you could add it to the tub. Thank you for this very simple and easy to follow instructions! I just made my first batch ever and very excited to see how it turned out 🙂 I was already a fan when I purchased the products and realized how much money I’d been wasting. I just made a batch and I hope it works. I do like the smell though. so sorry…i think i posted this in response to someone else so i wasn’t sure if you’d see it. apologize for the double comment! jelly stayed at the top. Everything works just as good as the other, no matter the texture. A great tip shared with me with a reader to get that store-bought consistency is to use an immersion blender on it. However, no matter the texture – the cleaning power is the same. I have a quick question… I have been using this detergent for several months now and love it!!! My husband gets arm pit stains and they are not coming very clean.. I bought some Shout to spray on before but even that isn’t helping. Can I do anything to help take them out? Oh wow, that seems like a pretty decent stain then! I’ve had a lot of success with the Tide Spray Stain Remover, I’ve found it works better than the other brands of stain removers. Hope this helps! I made this recipe and it is very very gelled. When I put rubber gloves on and squished it around it did get to the consistency you mentioned. Did I do something wrong? Mine is more gel than water.. I had to go in with my hands to loosen it up to the vague consistency everyone talks about.. I think I might need to use a blender for a smoother consistency.. Do y’all think this will still work right? I did everything just the way the instructions indicated..Thanks! Ps. I should mention that it was about freezing temperatures last night and got quite cool in the house while it was setting. Maybe this caused it? Temperature can definitely cause it – but no worries, it will work just the same! Some people actually prefer for it to get to the more gelled stage, and then they go in with an immersion blender and tell me that it turns into the same consistency of store-bought gel! Mine has turned into a more gelled state on occasion, mostly from me just forgetting about it and letting it sit too long – and I just go in with my hands and break it all up and use it as I normally would. The cleaning power is left unaffected. I accidentally used baking not washing soda….. can I still use it? Oops! I wouldn’t recommend it for the laundry. Baking soda doesn’t work like washing soda does in the wash.
That is very normal. A lot of us are taught to think that the sudsier it is the better. Actually it’s not the bubbly part that works but the ingredients. No foam means less gunk in the washer and less chance of a residue left on your clothing. No, this is a low sudsing soap, which makes it HE Washer safe! It’s not the suds that clean your clothes, but the soap itself – so no worries! I just finished washing my first load of clothes with this stuff and wow! Thank you so much! So quick and easy (a plus when you are great with child and have a 2 year old)! I wanted mine to be a little more smooth (but lacking an immersion blender) we used a paint mixer attachment for my husband’s drill. Cost about $7 at the local hardware giant and worked great! Yay! I’m so glad you had such wonderful results! I have used this same recipe for over a year now. As of lately, though, I’m noticing that many of my garments are coming out with small “spots” all over them. I’m making sure to mix the detergent before each load, but the spots still appear and DO NOT WASH OUT! Does anyone have any suggestions on how to avoid this problem? I recently had this (white splotches over some of my clothes) with a batch I’d made 1.5 years prior. I’m pretty sure it’s just that my detergent had dried out a bit, as I only got the spots when I poured the detergent onto the dry clothes, and didn’t get the spots when I added the detergent at the bottom of the bin or with the water streaming in. Do I have to use one of the two soaps suggested or may I use any? Do I have to use one of the suggested soap(fels-naptha) or may I use my own? You could definitely make your own! Finally made this last night, and this morning it was super gloppy just like you said. But I found that using a whisk during the process of mixing and then the next day using an immersion blender makes it completely smooth. Thank you so much for this recipe, we are going to save so much money!!!! I am on my second batch of this recipe and I love it. I let mine set up and then stir it with an paint stir attachment to my husband’s drill. I then pour it up into a empty laundry soap bottle and then fill a couple 2L drink bottles with it leaving some head room. When I need to refill my soap bottle I just shake up on of the 2L bottles and then pour it up. When my 2L bottles are empty I just refill from my bucket because I have found that mine settles some in both the buckets and bottle. This eliminates having to deal with stirring from the bucket everytime I need to refill my soap bottle. I use this same recipe, but I also add a cup of generic OxyClean that I find at Dollar Tree. It’s great for stains and whitening, and that $1 provides enough for three batches. I have made my detergent for 2 years and I love it. I use I cup borax and 1 cup washing soda, but I use 2 bars of zest or irish spring and I also add 2 cups of a good fabric softener. It smells good and the soap is a green color. I melt my grated soap in the microwave then pour it into my bucket , that is filled with the boiling water and fabric softener. It is quicker and easier this way. I then stir a few times the first day with my whisk. The next day I use my stick blender and it blends up perfectly. I started out making it different ways I had read about but this one is faster and easier. My soap would usually boil over and make a mess. Now all I have to wash is my bowl from the microwave, I keep all my supplies together and separate ready for just soap making. so from what i’m reading here is that ya can use basically any kind of bar soap and still use the borex & washing soda, and wouldn’t be a problem adding oxyclean to the mix for the whites, and with the ingredients this will make 5 gallons correct?, because i’m starting mine tomorrow. Is this safe to use with septic tanks? I made the homemade detergent yesterday and I’m now washing a small load. My question is its not soapy or blubbly in the wash, us this normal? Yes, this is perfectly normal – and it’s why it works in HE washers as well. No worries! Could you make a detergent “concentrate” and not worry about adding the extra water? Say you use the four cups for the soap, add the powders… would it be essential to add the gallons of water? Or could you blend the said ingredients and only use a tbsp or two of the mixture? I made this recipe and realized while I was making it that I had a 14oz bar of Zote instead of the 5.5oz it called for. I did the math and increased the Borax and Washing Soda but not the water. I figured it would just be concentrated and I could add water later. But now it is a VERY thick concoction, think oatmeal. When I put it in a container and add the water to it, it just doesn’t seem right. Help please. Can you make this as a “concentrate” by using half the water? Or will that mess things up? Oh this is so neat!! I am so trying this soon! I use a paint stirring attachment for a power drill to mix mine. It gives it a better consistency more like store bought. I didn’t have anything like that, and I needed Something to mix the gloppy stuff with! Lol. Duct tape to the rescue!! My son took a potato smasher (fortunately for him, not my favorite) and duct taped it to a 1/2″ pvc tube, a little over 2′ long. He taped the whole handle of the smasher to one end of the tube, wrapping the tape around 3 or 4 times. When I first let the detergent set overnight, I usually get a solid layer on top of the liquid. I use this contraption to break up the solid layer and mix up the detergent thoroughly. I’ve made 3 batches of the detergent since then, and the tape is still holding up as good as it was the first day. If I’m going to make my detergent with liquid castile soap (Dr. Bronners) How much do I use? And, do I need to heat it/mix with water & boil before adding it to the bucket? Made this last night, and it set up beautifully. Although, stirring the bucket was a bit of a pain, I finally broke down and grabbed my blender. Can’t wait till tomorrow to share with my mother, grandmother and a few friends. Do you use fabric softner with it or is it not needed? Thanks! Do you need to use fabric softner with this detergent? No, you don’t have to. That’s a personal preference. I grated the soap the first time and my hand hurt for two weeks, so this time I put the Fels Naptha in a jar of water and am letting it dissolve to make it easier on myself. It’s dissolving. Has anyone had trouble with their pipes clogging because of this detergent? Can you melt in the purex crystals for scent instead of using the oils ? I have used a liquid version that doesn’t need any grating for years: 1 Gal hot water, 1/4 cup washing soda, 1/4 cup borax, and 1/4 cup liquid Dawn (the blue only). Easier than grating and boiling stuff. Don’t buy washing soda… you can make it by putting baking soda in the oven at 400 degrees for about 4 hrs. To update about my mistake. It was no big deal. The detergent worked great. Even my adult son-a welder who stops in once a week to do his laundry 🙂 – likes this stuff. I made this and I absolutely LOVE it!!! Ive been looking for ways to save money especially with expecting a newborn in just a few weeks. I will never buy laundry soap again!! I will be making more this week to have some spare so I dont have to worry about running out when the baby gets here!! Thank you!! I made this and there is no gel to it at all. It is all completely liquid. Like water basically. It smells lovely, but if I try to pour it in the detergent drawer of my front loader, it just goes right through the drawer because it is so thin. What might I have done wrong? And is there any way to thicken it? This is great thank you so much for the recipe!!! Question when soap is in washer is it suppose to Sud up like normal detergent. No, it doesn’t suds up. You can turn your baking soda into washing soda and make this even cheaper! Natures Nurture blog gives these instructions and it’s really simple! The process is really simple. Just heat your oven to 400 F (or 200 C), sprinkle some baking soda on a shallow pan, and bake it for about half hour, until it changes composition. You should also stir it up occasionally, just so that it bakes more evenly.So how do you know when it changes into washing soda? That part takes a little more work; just a closer, watchful eye. Once you know the differences between the 2 sodas, you’ll be able to tell in no time. Penny breaks it down like this: Baking soda is powdery, crystallized like salt, and clumps together. Washing soda is grainy, dull and opaque, and is separate grains. Could I use liquid castile soap instead of the bar? How much? I made two batches and the one won’t gel. I did everything the same. Is there anything I can do to salvage or is it a compete loss? It will work just as good in the watery form, sometimes I get a batch that is watery and I use it just the same. I have never really noticed a difference. I just made my 2nd 5 gallon bucket using basically this recipe. I substituted Zote soap flakes so I wouldn’t have to grate the soap (I’m into as EASY as possible) and I used a bit less borax and added oxi-clean. I kept the soap in the 5 gallon bucket next to the wash machine in the basement since it is not an area we use for anything but laundry. I just scoop it out with a measuring cup and use it in my front-load wash machine. My familly has noticed NO difference in our laundry. It is clean and smells as if we used unscented detergent. It takes about 20 minutes to make start to finish – and is very worth it. I got over 100 loads out of one bucket – I tend to use more like 3/4 cup instead of 1/2 cup – so I could probably have gotten more. THANK YOU for the recipe. How can i make it smell like tide or fain without acctualy adding tide or gain to it. And how much would i have to add to a 5 gallon bucket?? 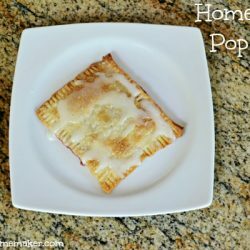 We have tried this twice we followed the recipe except we added a box of baking soda. The first time we got a big foam that fired on top and second time a hard like soap bar formed on top. It seemed that’s where the cleaning components went is in the foam and water underneath both times. What are we doing wrong?? I would say adding the baking soda was what did it. I would not add any baking soda to the mixture, and just go with the washing soda. You need to use washing soda, not baking soda. You find it in the laundry isle. I have been making this recipe for over a year now. It is terrific. I have found that it is best to store the homemade detergent in heavier containers, such as vinegar and Dr Bonner’s soap type containers. I have stored the detergent in gallon milk containers and have had problems with the containers leaking. I have no problems with the heavier plastic containers. Thank you for sharing this recipe. So, how much do I use in a normal load of laundry? Do I just measure it as usual, about a cup per load? I’ve made this twice (lasts me about a year with two of us). I use Zote soap bar it’s a bit chunkier than the Fels-Naptha (and same price). It makes the whole house smell wonderful when “cooking” and setting in the bucket. I also use cold wash and rinse and have not had any problems with stains, odor, or leftover residue. I add a bit of vinegar to the wash and no problems. We love this detergent and haven’t bought any since a year ago. I do have one question I was going to give some to a friend but they have one of those HE washers and I was wondering if this detergent was safe to use with those? Thanks you for sharing this wonderful detergent. We have been hearing about complaints of skin irritation brought by chemical in laundry detergents. The shift from chemicals to natural ingredients is a great idea to address these concerns. how can I make it more foamy? do what do I have to add? I don’t really think there’s a way to may it more foamy – but ‘foam’ doesn’t clean the clothes any better so there really isn’t a reason to need to make it that way. Hope that helps! Can anyone tell me whether or not this detergent is safe for newborns? Ive been making it for about a year & love it! I’m not a professional, but as a mom I used it with my son when he was a newborn with no issues & he had very sensitive skin. I made this soap yesterday and im disappointed I followed the directions to a t but it came out extremely watery. I don’t know what went wrong!!! So not happy about this! It will still clean well. Can you use purex crystal instead of essential oils? To those who ask about Castile soap for use in laundry detergent: no. 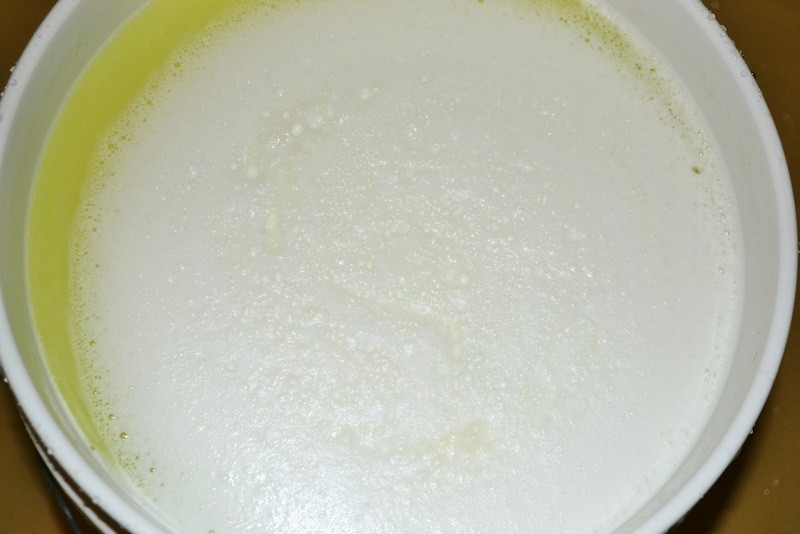 It’s has a super-fat (meaning that some fat has not been turned into soap by the lye). Laundry bars are 0% super-fat. You don’t want that extra oil in your laundry: it’s good for your skin but not for your clothes. If you used a bar of soap with 0% SF on your skin it would severely dry it out. Do you know how well it works for cloth diapers/inserts? I don’t want to use the wrong detergent and. A use my diapers to get a build iPhone of some kind…. any reports on that? I made this for well over a year and had nothing but problems. My clothes got dingy and my towels stopped absorbing, and then one day my dryer broke in a kind of catastrophic way – think smoke and flames. The dryer repair man said he had never seen anything like it, but the entire inside of my dryer was coated with soap scum! Apparently my homemade detergent had cause soap scum to build up on the inner workings of my dryer and on my towels and clothes. So gross! I did a soak in REAL detergent – Foca, which costs $3 for a GIANT bag – and you would not believe how disgusting the water looked. Beware of this laundry detergent! I’m curious: did you use regular bar soap instead of the Fels Naptha? We’ve been using a nearly identical recipe to the one above for about a year without any issues, but I’ve heard that castille soap can cause issues. (asking because we’re about to make a new batch & I was thinking of going with the castille this time). I have used castille soap with no issues, but I make sure I purchase 100% castille soap for best results. Okay, I realize I’m responding to 2-year-old comments here, lol, but for the benefit of anyone reading this from here on out, here’s my take: I too have used this laundry detergent, not quite a whole year but I’ve made 2 batches of the very recipe outlined here on the author’s original post. I love it!! It’s sort of mind-blowing when you use it the first time and discover just how awesome it is! Just for fun I’ve been sitting here reading EVERY SINGLE COMMENT on this post (I’m a little bit warped that way, lol) and the vast majority of them fall into 2 categories: a) this stuff is amazing or, b) can I use ________ soap or OxyClean? I can count on one hand the ones saying “beware” of using this laundry soap. In fact, I think I’ve only seen two comments like that, out of hundreds here!! Sorry for rambling about this, but I just want to assure the readers that this homemade laundry soap is the real deal, and I seriously doubt Jill Bristow’s comment is even true. P.S. 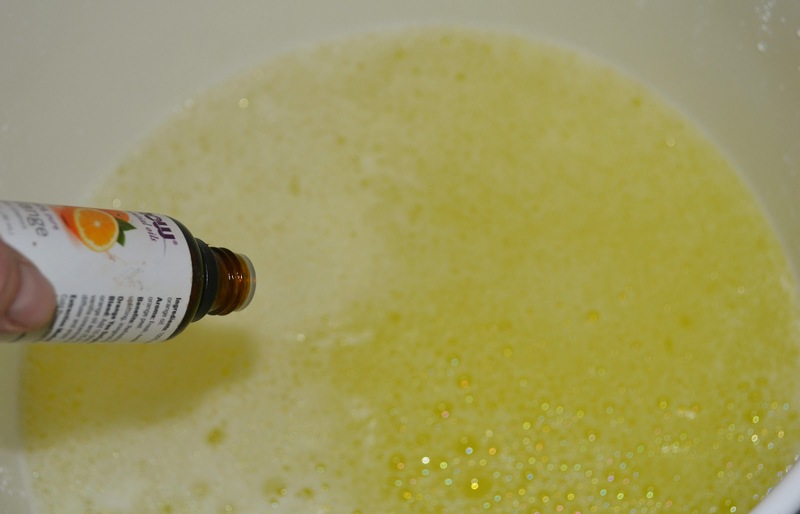 Because this has been bugging me: to all of you wondering if you can substitute some other kind of soap for the Fels Naptha – why don’t you try it anyway and experiment? Be a scientist, then come back here and post to us how it went! On that note, I’d also like to add this: it’s soap. The liquid castille, the bar soap, Zote, Dr. Bronner’s, Kirk’s, Irish Spring … it will change the recipe but it’s not going to ruin it. Have some fun with it. At worst, you’re out a couple bucks and however much time it took you to make it. Too many people here have this fear of, oh no, what if I use something different and it’s ruined and then I have a 5-gallon bucket of useless glop?? And if it doesn’t get your clothes clean (but I’m guessing it will) you can probably use it as dish soap or hand soap? Or soak the kids’ toys in it soap? I made 5 gallons of laundry soap and mine doesn’t make any sudds. Is this normal and if it is has can I make it so it does make suds. I am sorry I no I am funny I believe my clothes don’t get clean with out suds. Can you reuse the pot after for food or will everything taste like soap? Of course you can use the pot. They are just cleaning supplies, they aren’t going to leach anything into a metal pot; wash your pot normally and you’ll be fine. How does this smell if you do not use any essential oils added to it? I am aware of how Fels Naptha smells but not the other products. I made 10 gallons of liquid laundry detergent. I have a family of four and it was gone within 4-5 months. However, to account why it went so fast I gave probably 5 gallons away! Everyone loves it! I did this and our clothes started smelling very bad any time any did any sweating. We stopped using it and our clothes quit doing that………any ideas why? 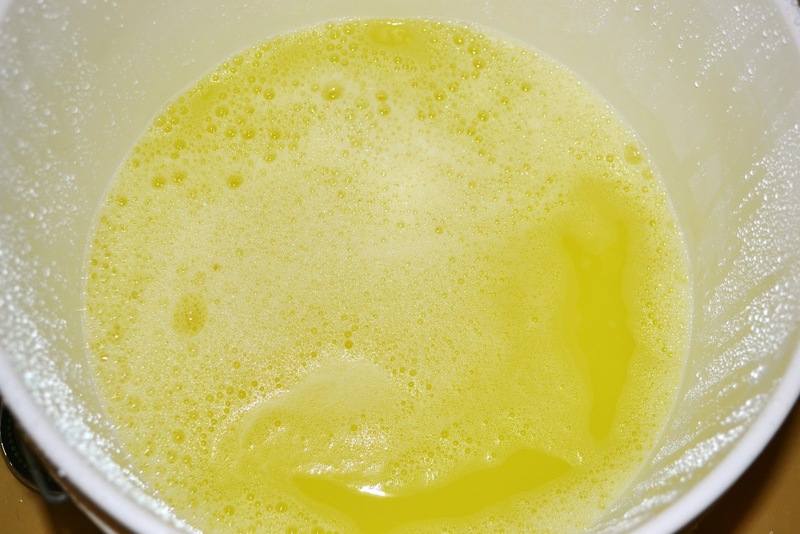 i made mine using liquid castile soap and i find that it is a very watery consistency. How can i thicken it? Hi! I’m loving this idea! You used 1 bar of soap, right? I made it last night and want to make sure I got that right. Thanks!! Ok, i did this and have 5 gallons of goo! Do I just drop the goo directly in the washer as I fill it up? How do you put goo into laundry containers? It doesn’t pour out like water?? You may need to restir it occasionally. I just give the smaller bottle of it that I keep on the washer a quick shake before each use. Would I be able to add a cup of oxiclean in addition to the other powders or would that mess with the consistency? I have been making this for a few months now, and I absolutely love it. It’s easy to make and cheap to. 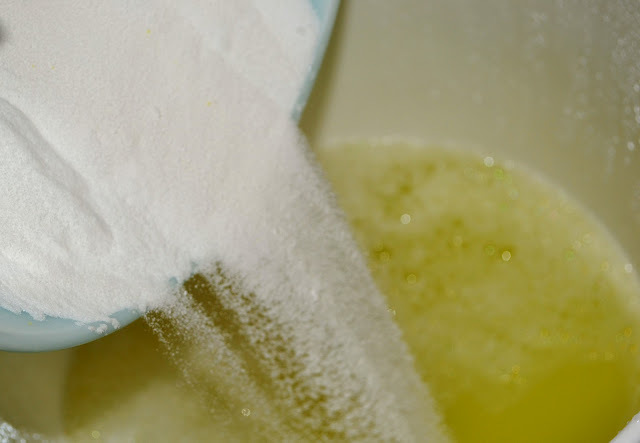 I have had and so has my children, allergic reactions to a lot of store bought brands of laundry detergent, but I have found with this homemade detergent we no longer itch and break out. My expenses are better also. Doesn’t cost a lot to make it and actually it’s fun making it. Thanks so much for sharing this homemade laundry detergent recipe. You have helped me so much. I have been making this soap for over a year and I still can’t get my soap shreds to completely melt.. What am I doing wrong?? It takes a whole cup per large load? That seems like a lot. I just made my first batch of this and it seems as if it works well. But I have that old idea still stuck in my head that there has to be bubbles in order for it to be getting clean. When added to my top-loading washer, my water + laundry soap mixture looks almost clear (no bubbles at all). Is this normal? That’s the good part about this detergent. The bubbles aren’t necessary, and from what I read when I first got my HE washer, they tend to ‘gunk up’-my words- the washer. My clothes have been much cleaner since I’ve been using this detergent. It took a couple washes before I really noticed the difference-I held a couple shirts back, to compare. I’m not sure why, though. When you say a CUP. is that an 8 oz cup or are you talking about a laundry cup like on the regular detergent bottle? I use a regular laundry cup. I know this isn’t my recipe, nor my site, so I apologize if I’m stepping on anyone’s toes, but I see you don’t have a response. 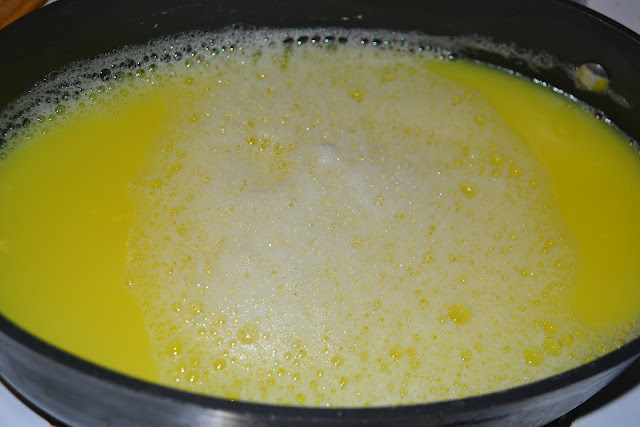 After my first batch, I started doubling the water in the pot, and after the Fels-Naptha is melted, I add a cup of the borax and washing soda, and bring them to a slow boil, stirring frequently on low heat, until they are dissolved. Then about another ten minutes. Be sure to keep an eye on it. It will over-boil. I don’t have a really large stockpot to use though. When I add it to the bucket and add hot water, I do add orange essential oil. I didn’t have a problem with odor before I used the essential oil, though. My son stayed with me for a little while, between ‘away’ jobs; he’s a welder…a dirty, smelly job. His clothes always came out clean. He liked this detergent much more than any brand out there. Hope this helps, if you try again! Can you still use bleach with this? Yep. The same as you would with any other detergent. out clean! I’ll never go back to store bought detergent! Thanks! how much of this mixture do I use for one large load of laundry? I have a High E washer. I just made this for the third time yesterday. I seem to do a little better every time I make it! I like using the immersion blender to get rid of globs. I use it a time or two on the day I make it it, then again before I use it for the first time. This time around I added in some Purex Crystals (I used the “Well Being” with essential oils). I put them in towards the end of melting the Fels Naptha. Worked great! It made the detergent smell amazing! If I have a HE washer do I put the detergent in the dispenser or directly in the washer? I have been using this exact recipe for a while. It is the best one I’ve found and has saved us a ton of money.My husband and I go through it pretty quick and now with a new baby, even faster. It’s gotten to where I can’t stand the smell of the fake scents in store bought detergent (that I used to love). I also throw a little vinegar in a downy ball as a fabric softener. It doesn’t make your clothes smell like vinegar at all. Thank-you, thank-you, thank-you for posting this recipe. I have lots of allergies to commercial additives. I’m looking forward to trying this. I and my pocketbook love your home made laundry detergent! Thank you! I just made the second batch of this liquid laundry detergent. I followed the directions exactly as written. Then let it sit in the 5 gallon bucket with a tight fitting lid for about 36 hours. My husband used his drill with the long paint stirrer to properly mix it until the gel was completely dissolved. I then used a funnel in the clean plastic gallon jugs to pour the detergent from the bucket to the gallon jugs. I used a 2 cup measuring cup to do this. I only filled the gallon jugs about 3/4 full to leave room to shake/mix it as I use it for my laundry. The jugs stay in our garage until I’m ready to bring one jug at a time into the laundry room; there isy no spoilage in hot or cold weather. This is my first time making this. I heated the bar soap tell melted then mixed with powders. Let it sit in jar and the liquid is on bottom and on top it looks the bar soap is hard. How do I get this to be a gel? I absolutely love this recipe! We do at least 2 loads a day, and the money I’ve saved is incredible. The only change I made, is I use my own home made bar soap. (I refuse to buy store bought bar soap.) I’m saving money, and I know exactly what chemicals are in it! Great cleaning power, great smell, great value. Everything a home made product should have! Thank you so much! Has anyone made this without Borax? Are there adjustments that need to be made? Is it still as effective? Just came across this site looking for liquid detergent to make. I have been making powder for about a year and love it, just wanted to try liquid. My batch has NOT gelled AT ALL. Use as is or wait longer?? Its been over 24 hours. I think you can, but it probably wont gel like it would with bar soap. do you have to wait for the 24 hours before you can use it? You can use some right away. Then let the rest gel overnight. Is the detergent safe for he machines? Yes. I made one batch without the added Tide and used 1/2 c for large loads. Now I’m making the next batch with a liquid detergent added for the scent because I missed having the laundry detergent smell. Gets super clean, doesn’t get sudsy and therefore is HE machine safe. Just found this post and an FYI – 1 TBS of liquid laundry detergent is all you need to get your laundry clean. This was told to us by a repair man – when questioned, he said, “who writes the directions for the amount of detergent needed for a load?”. Yup, that’s right, the detergent manufacturing company and if you use more then you have to buy more! Most problems with washing machines is because too much detergent is being used and clogs everything up! 1C seems like a lot of detergent. Is this really the amount used? I think it depends on the size of the load and how dirty the clothes are. Play around with it and see what amount works for you. I’ve been making this for over a year now. It works great on getting dirty gunk off clothes, but it doesn’t do a very good job on odors. I didn’t use essential oils though, so that might fix it. The only real complaint I have is the globs. It doesn’t work properly in my detergent dispenser. I don’t mind it that much except it means my husband complains and is that much less likely to do a load. Always make sure you read the directions – I added the borax to the pot ON THE STOVE – let’s just say – it erupted!! Haha! SMH! I use this for a HE washer? Can I use this with a HE washer? Does anyone use an unscented soap in place of the Fels-Naptha I just made my first batch and I’m not a fan of the fragrance, I was planning on adding essential oils but don’t think it will go well with the Fel-Naptha. Any suggestion. Thank you for a wonderful recipe. I misplaced my old recipe, but now have yours saved. THANK YOU!!! This recipe is the BEST. We do a LOT of laundry. Each of us has noticed that this liquid laundry soap gets our clothes cleaner than the store bought stuff. We have very hard well water so I add 1/2 cup to each load, plus I use distilled water to make this. Just love this laundry soap! 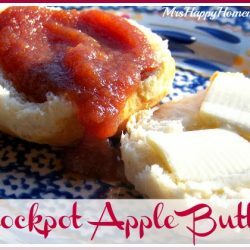 I have been using this recipe for years and LOVE it! At one time I lost the recipe and tried another one, which I did not like at all. I’m so glad I found this one again!!! It lasts forever, is inexpensive, and works the best. After I make it, I re-stir it and move about 1/2 gallon to another container (I use a 1 gallon ice tea bottle with a handle.) Then I can shake it if it starts to separate or add some more water if it’s too thick. I also stir the big bucket once in a while. I will never buy laundry detergent again. I just tried this today, with a few mods. I live alone, so I scaled the recipe down for 2 gallons instead of 5 since I only use about 2 gallons of liquid detergent per year. I also used Dr. Bronner’s lavendar castile soap instead of Fels Naptha. It’s sitting for 24 hours now, so I plan to let you know how it turns out tomorrow! My soap turned out runny, but I used it with a load of laundry and it still cleans well! I’m going to try the salt solution to see if that thickens it and will try to remember to update again tomorrow. The salt solution didn’t work, it just made foam on the surface. I think next time I’ll use more of the bar soap or try Zote, which has a less dubious ingredients list than Fels Naptha. Turn oven on 400 degrees F.
Pour a thick (1/2 inch or so) layer of baking soda on the bottom of the baking dish. Let cool and store in air-tight jar. You really need to to keep it clean. If you can’t get a lid, cover it with aluminum foil. Rather than putting in all that water, I just dissolve my soaps in 1 Qt of boiling hot water & put it into a smaller container using 1t – 1T depending on how dirty the laundry is. I just made this last night couldn’t wait to try it out. So I did aload of clothes, but there’s no suds . What did I do wrong? In South Africa, prices are that great so my mixture came out to $10 for 5 gallons. This is 2017 though. I used mass instead of volume to measure out the Borax and Washing Soda so I hope it works out. To make 4.5l worth of washing liquid. About 20 drops of essential oils. The effective ratio of 5 gallons to 4.5 litres is 4.2. If you use Castile soap instead of gels nspyga or zote, do you even need to hear it up? Doesn’t seem like it. No you don’t since it’s already liquid. Just made a batch. I suspect it will work well, since it’s the same recipe as the powdered version I’ve made before. One alteration I made: I substituted handmade lye soap for the Fels-Naptha. After this, I’m going to try the 137 year old recipe I inherited for Diamond Labor Saving Laundry Soap (dated 1880). It’s in near mint condition, and the ingredients are easy to locate. What can i add to make it a little thicker? Even if it means doubling the recipe, it would still be WAY cheaper yhan the store bought.. i have been using the washing soda for about 4 yrs now, but this recipe would last me sooooo much longer. It just seems a little too runny for comfort. You can let it sit for 48 hours instead before stirring the first time to thicken longer. Before I attempt to make your laundry detergent, is it safe for severe eczema? I can’t speak for you… but I have pretty severe eczema & it’s the only thing I use. I followed the instructions and everything went as stated-until I let it sit. 24 hours later and it gelled up like jello; a big 5gallon clump of gel. Can I still use it? Anyone else have this happen? Yup, you can still use it! Just give it a really good stir first. Is this recipe safe for HE washers? We just bought a new washing machine and it says to use HE liquid soap only. Thank you ! She says in the article above to use 1/2 cup in HE washers. I know im late to the game on this, but do you have to let it sit for 24 hours or can you use it right away? Would it be ok to add oxiclean to this mixture when the water in the bucket is still hot ? That’s one I’ve never tried before but I’ve heard success from others. Great question! I’d like to know that myself because I don’t use liquid bleach anymore due to yellow’ish spots it leaves on our white clothes. Another bleach type additive would be great that I wouldn’t have to add seperately. 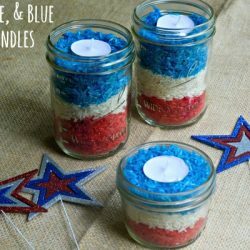 Another recipe I saw used twice as much borax and washing soda? What’s the reason? Heehee~I have FMS, which acted up yesterday-of course when I need to make more detergent. I’ve been using this recipe for a long time. Thought I’d do part last night, and the rest today, so I grated up the Fels-Naptha, and put it in a pot with hot water. I wanted it to melt so I took a slotted spoon and stirred, stirred, stirred, but not on the stove. Now I have a pot filled with Fels-Naptha fluff. 😉 Kinda hoped it would ‘go down’ overnight, but it didn’t. I’m sure it will be fine in the end, just thought I’d share a laugh… This is better than the time I thought I’d put a cup of Oxy-Clean in..while the pot of Fels-Naptha was on the stove . Don’t do it!! I watched it foam higher and higher~Time I thought to take the pot to the sink, Yeah, I had a 3ft long trail of foam. Can this be used in HE washer? Yes! That’s all I use! I just made my 4th batch of this detergent. It lasts us about 11 months and it’s the only detergent I use. 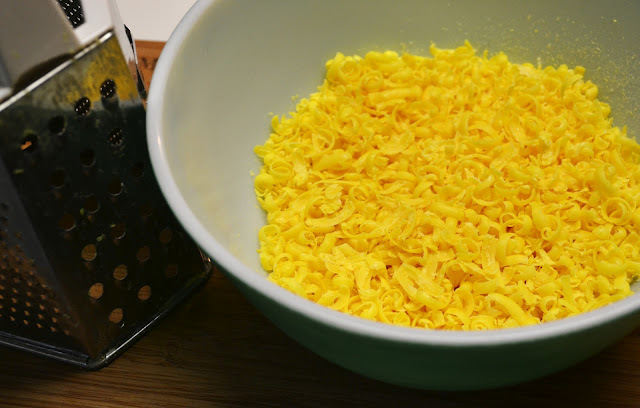 I grate the Fels Naptha with my Zyliss grater (like they have at the Olive Garden) and it goes very quickly. I also use the long “arm” on the kitchen sink faucet to fill the bucket with water which makes it easier for me since the heavy bucket is on the floor at that point. I do use my immersion blender when I make the detergent and every time I refill my old store bought container. I cut the detergent in half with hot water when I refill my container/dispenser. This is both very economical and efficient for washing. Hi! Cool recipe!! Is it possible to concentrate this (use same amount of everything but much less water) into 1 gallon (thats the size of my laundry detergent container) and just use much less when washing? I make this dry and scoop a tablespoon into the washer (front loader he type) and use the prewash. I do still add a little liquid detergent (one tablespoon) as well. One change I do make to the recipe. I add 1/2 Cup of Citric Acid (dry) when mixing the batch. My water is terrible and I do not have a softener. Black or dark clothes never get the mineral buildup and I’ve got clothes that are old. I have been monitoring the old dark clothes and it actually seems to clean up any buildup. I do use the Zote soap, just like the scent. I have made batches with more natural soaps and they do get pretty gummy. I open the Zote packages when I get home so they can dry out some by the time I am ready to use them. I would like to use this as a liquid but I usually wind up with a bunch of soap on top of the water. I am hoping to find something that will help keep the liquid in suspension. I love the idea of making my own laundry detergent. I just made some and I used my kitchen pot and bowl. I was wondering if my pots and bowls are safe to use after? They are! I use my regular every day pots and bowls and just washe them after. No residue! I made the recipe and got a mass of gel in the middle of the liquid the next day. I bought a paint stirrer that attaches to the drill and was able to blend it up to be more consistent. The soap works well. I’m going to try Zote instead of Fels-Naptha next time to see what results I get. I prefer the smell of Zote. It works very well in this recipe. I used to be able to find Zote flakes when I lived in NC, but here in WV we just have the bars. I bought a cheap grater and viola…soap shreds! Do you have hard water ? Can you use liquid castile soap instead of grating a bar of laundry soap? I already have the liquid and I would rather not spend the time grating soap if I could avoid it. Is this safe in the newer “high efficiency” washers??? Oh my, it’s amazing. I give this to my friends as gifts and to enlighten them. The best part of using the Fels-Naptha soap is that it helps get rid of the oils of poison ivy if you are washing your grubby landscaper sons clothing! What is the reason for it remaining liquid and not thickening up? I followed the recipe, but it is def very humid here. Wish I could get it thicker, but I love the recipe. Thanks! I’ve been thinking about making my own for a while now and it seems easy and economical! Thanks for the great instructions! Since it’s just two of us in the house, I’ll make a half batch. Borax and arm and hammer…. do I start all over? Do I maybe mix it real good with hot water and pour it in the bucket, I still have some room to add more fluid, then let it sit another 24hrs? You really need those ingredients for it to clean properly and I’m honestly not sure how it would work if you did it after. I wish I could give better advice but I don’t know other than to try it and see. Sorry I couldn’t be better help! Wonderful cleaning recipe! All I want to ask is that will it work on colored clothes? I have been using this recipe for a year now and absolutely love it. Thank you so much you have saved my family so much money. It works wonderfully!! Looks delicious, easy to make and really good with essential oil for scent, I’ll try to make this weekend, hope it good :)). Thanks so much for this.